IT is such a simple idea, so plainly obvious that many Southerners can’t believe they didn’t think of it first: take the South’s trademark refreshment — sweet iced tea — and make it alcoholic. That, essentially, was the recipe used by a South Carolina distillery last year to create a phenomenon. Its elixir, Firefly Sweet Tea Vodka, tastes almost exactly like the beloved sweet tea poured at generations of Southern family reunions, church meetings and picnics. 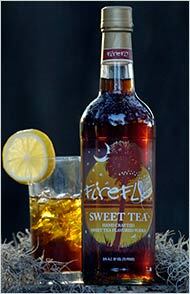 The story I’d like to write is about Firefly, the sweet tea-flavored vodka (http://www.fireflyvodka.com), a new liquor that has already become a legitimate phenomenon in the South and is about to start nationwide distribution by this spring. The drink is made by a small distillery in South Carolina near Charleston not far from the only remaining tea farm in America. It seemed like an obvious combination, with two of the South’s favorite pasttimes — cold tea and easy drinking — together at last. And when it hit the shelves, South Carolinians wondered what took somebody so long to think of it. One liquor store owner on Hilton Head told me he that even with the recession and down tourism numbers this summer, he had his best year ever, thanks in large part to Firefly sales. The demand quickly got so high that the company had to open up a second distillery in Florida. The owner of a magic shop in downtown Charleston tell me about how the drink is an evil temptress dressed in a Sunday church hat: “I just get so drunk off it because it’s just like I’m drinking tea,” she said. The drink has a kick, but isn’t too strong. Mixed with lemonade and lots of ice, it’s like a bottled version of a summer day escaping the heat on a Lowcountry porch. Now, the company is preparing distribution in all 50 states, including places where the idea of “sweet tea” doesn’t even exist, such as New York and New Jersey. Once word got around, liquor stores could barely keep it in stock. Several stores in Charleston didn’t even bother putting it on the shelves, instead just piling boxes on the floor and letting customers dig through. Some bartenders on Hilton Head Island complained to me that customers had virtually stopped ordering all other drinks. The drink has a kick, but isn’t too strong. Mixed with lemonade and lots of ice, it’s like a bottled version of a summer day escaping the heat on a Lowcountry porch. F my life. OK, not really, I’m going to keep pitching it, because there’s more that can be written about it. This entry was posted in New York City, newspapers, writing and tagged firefly, freelancing, New York Times, story pitches, sweet tea. Bookmark the permalink. Well, you would have had a better chance if you had not had at least two typos in the query. Mighty suspicious how similar the lede is from the Time’s article. Perhaps they’ve hired Jason Blair back. it almost sounds like the guy who wrote the article read your letter first! wtf?! ?